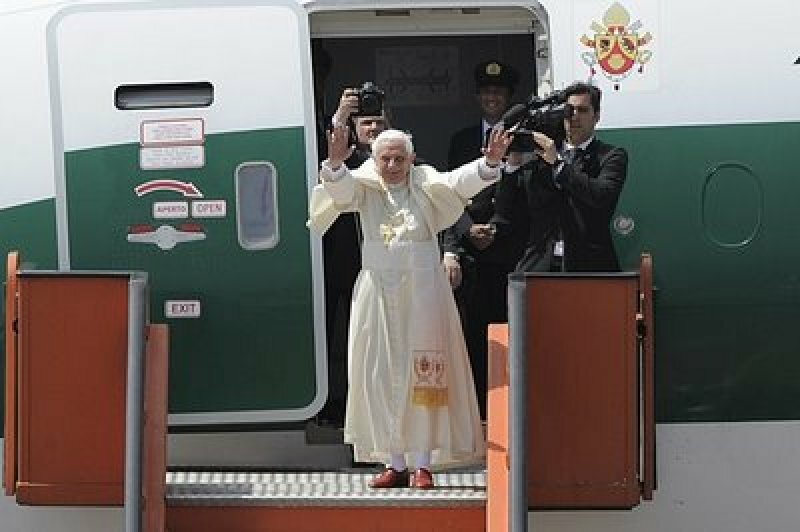 Benedict XVI is in Benin, 22nd international trip, during which deliver the Apostolic Exhortation "Africae munus" which contains the conclusions of the Pope on the Synod for Africa. Avoid " pitfalls" as the unconditional submission to the laws of the market or finance, the extreme politicization of the religious tensions at the expense of the common good, or finally the disintegration of human cultural, ethical and religious values. Cotonou (AsiaNews) - "Modernity need not provoke fear, but neither can it be constructed by neglecting the past" but is "accompanied" by avoiding " pitfalls" as the " such as unconditional surrender to the law of the market or that of finance, nationalism or exaggerated and sterile tribalism which can become destructive, a politicization of interreligious tensions to the detriment of the common good, or finally the erosion of human, cultural, ethical and religious values". Upon his arrival in Cotonou, Benin, on his 22nd international trip, Benedict XVI has indicated issues which involve not only Africa, but all those countries that are facing the conflict between modernization and cultural heritage. Welcomed in a festive atmosphere at the international airport "Cardinal Bernardin Gantin" by the President of the Republic of Benin, Thomas Yayi Boni, the Pope stressed that " he transition to modernity must be guided by sure criteria based on recognized virtues," such as "those which are firmly rooted in the dignity of the person, the importance of the family and respect for life. All of these values exist in view of the common good which must take first place, and which must constitute the primary concern of all in positions of responsibility. God trusts in man and desires his good. It is our task to respond, in honesty and justice, to his high expectations".
" The Church, for her part, offers her own specific contribution. By her presence, her prayer and her various works of mercy, especially in education and health care, she wishes to give her best to everyone. She wants to be close to those who are in need, near to those who search for God. She wants to make it understood that God is neither absent nor irrelevant as some would have us believe but that he is the friend of man". Benedict XVI’s journey, through to Sunday, has at its heart the delivery of the Apostolic Exhortation "Africae munus" which contains the conclusions of the Pope on the Synod for Africa. The document, which will be delivered Sunday to the African bishops, stresses the equal dignity of man and woman, and in particular highlights the unique and irreplaceable role of the African woman in the Church and in society. As much was anticipated by the Secretary General of the Synod, Archbishop Nikola Eterovic in an interview with L'Osservatore Romano. "The Pope - said Eterovic - invited the bishops to encourage the education of women so that they can take their share of responsibility in the social and ecclesial communities. On the one hand, he urges everyone to contribute to a need to promote women's liberation from all practices, including ancestral, that humiliate and degrade. On the other hand, he emphasizes the great female talents in the service of reconciliation through the acceptance, tenderness, mercy, and defense of human dignity and, in particular, of life. Women contribute to the humanization of society, especially through the education of youth. A wide field of activity of evangelization are open to them in their respective families, associations and societies. " A continent and society that has "major problems and difficulties, but the world has big problems and difficulties", as the pope said during the flight to Benin, answering some questions from journalists covering the visit. He explained that he sees Africa as the "spiritual lungs of the world" because "there is a humanism and the continent shows a fresh reserve of life and vitality for the future ,on which we can rely." Responding to a question on how Catholicism is facing the growing rise of Evangelical or Pentecostal churches, which propose an "attractive" and, in some ways, "simplified" faith the Pope replied: "we must not imitate these communities, but ask what we can do to revitalize the Catholic faith. " Hence the need for the announcement of a "simple, deep, understandable message." " It’s important that Christianity doesn’t come as a difficult European system, one which someone else can’t understand or realize, but as a universal message that God exists, God matters, God knows us and loves us, and that in concrete, religion provokes collaboration and fraternity". " Then it is also important that our institutions not be too heavy. What must be prevalent is the initiative of the community and the person. Finally, I would say that a participative liturgy is important, but one that’s not sentimental. Worship must not be simply an expression of sentiments, but raise up the presence and the mystery of God into which he enter and by which we allow ourselves to be formed". Pope: politicians of the world, "do not deprive your peoples of hope! "